Self-contained marine HVAC units are typically the best choice for smaller boats up to about 12 meters (40 feet) due to the lower cost of the units and installation. A self-contained air conditioner has all of the major components mounted on a single chassis, which is installed in the living area; usually under a bunk or settee, or in a locker. Cooling-only models are available, as well as reverse-cycle, which can cool or heat. Also available are air conditioning kits, which include the self-contained unit, water pump, ducting, and grilles- all the components needed for a complete system. A single unit can cool each cabin, or can be ducted to two or more cabins to save space and cost. Self-contained units often require less power than other systems due to the highly efficient rotary compressors. 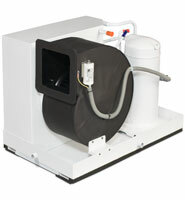 The StowAway marine air conditioner offers cooling and heating in a compact, low-profile unit. 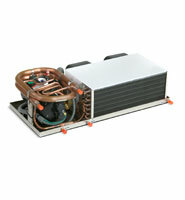 It has a seawater-cooled condenser, a high-efficiency compressor, and uses the Q-Logic control (sold separately). The Breeze delivers high-velocity cold air (or hot) onto the bridge, cockpit, or deck using an innovative horizontal compressor. The 16,000 BTU/hr. self-contained units stand just 8 inches (203 mm) high and is easily ducted to confined spaces like flybridge dashboards and consoles. The Breeze units use R-410A, an environmentally safe refrigerant with exceptional thermodynamic properties that maximize system efficiency. The Breeze remote systems are also available, which consist of low-profile, 16,000 BTU/hr. 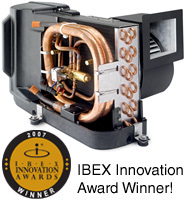 direct expansion evaporators or chilled water air handlers. The Vector Compact series of self-contained marine air conditioners offers 18K and 27K BUT/hr. of cooling and heating. These high-capacity marine HVAC units were engineered to harness and maximize the impressive performance of R-410A, a proven and reliable environmentally safe refrigerant. All models offer direct expansion operation in a compact, low-profile package with a seawater-cooled condenser and choice of controls. Featuring high-velocity, fully-rotatable blowers, Vector Compact units are designed for installation under a settee or berth, in a locker or cabinet, or other convenient location.